Kwara Gov. signs 2018 Budget of N190.9bn into law, pledges improved welfare, infrastructure – Royal Times of Nigeria. The people of Kwara State have been assured of improved welfare and infrastructure in the coming year. 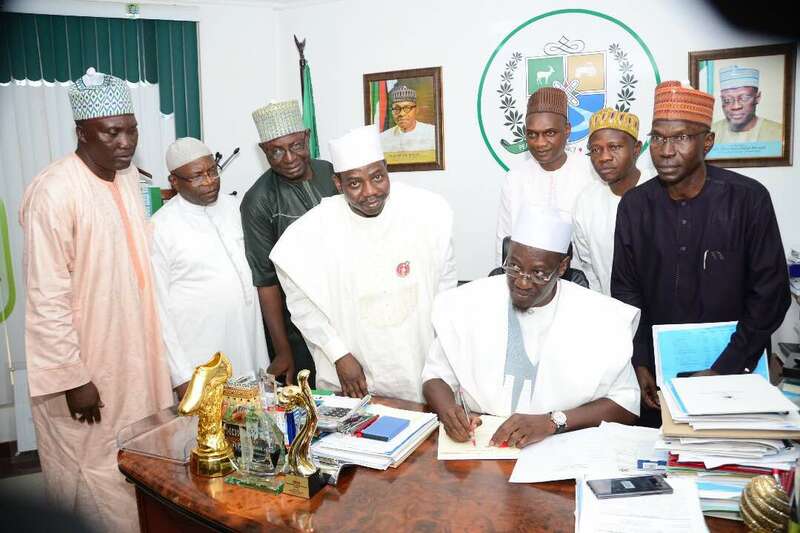 The State Governor, Alhaji Abdulfatah Ahmed gave the assurance while signing into law the State’s 2018 budget of N190,997,425.571, as passed by the State House of Assembly. Governor Ahmed also promised that in the coming year, focus will be on ensuring that all ongoing and new projects across the State are completed before the expiration of his administration. He listed some of the ongoing projects to include Geri-Alimi Daimond Underpass, new campuses of Kwara State University (KWASU) in Ekiti and Ilesha-Baruba, dualisation of Kulende-Sango-UITH-Oke Oyi road, New State Secretariat for civil servants, Rore-Ipetu-Arandun, Anilelerin road; Share-Oke Ode road, among others. Speaking further, Alhaji Ahmed said the State government under his leadership would work harder to boost the state’s economy, create more jobs and enhance the welfare of the people. He said in line with the commitment of the State government to the wellbeing and health of its people, all arrangements have been concluded to commence the State Health Insurance Scheme in 2018. According to him, under the new scheme, all categories of people in the State will enjoy access to qualitative and affordable healthcare. The governor also pledged that the state government would strive to ensure adequate implementation of the 2018 budget and achieve better rating than the 70% implementation recorded in the 2017 budget. He added that there will also be renewed efficiency in the collection and management of Internally Generated Revenue (IGR) of the State. Governor Ahmed commended members of the State House of Assembly led by Speaker, Hon. Ali Ahmad for the speedy consideration and passage of the budget, which has ensured the State’s return to the January – December budget cycle for the first time in ten years. Recall that the House last Thursday passed the 2018 budget of N190.9b, which N9,111,369,016, higher than the N181,886,056,555 budget estimates presented to the legislature by Governor Ahmed in November. The budget tagged “Budget of Sustained Growth and Prosperity” has a provision of N110,689,173.434 (58%) for Capital Expenditure and N74,702,775.870 (42%) for Recurrent Expenditure.